For musician Bettina Cheung, pursuing her MD/PhD degrees at Feinberg didn’t mean having to hang up her French horn. Instead, she helped create a rich new outlet at Northwestern for musicians in medicine. In the spring of 2018, Cheung co-founded the Northwestern Medical Orchestra with Michael Wang. The two medical students, who had helped lead an orchestra while undergraduates at Yale University, were eager to cultivate a similar experience at Feinberg. The Northwestern Medical Orchestra has since grown to an ensemble of more than 60 students, faculty, residents, staff and clinicians around campus, joined together by a love of instrumental music. During its first season, the group held three public concerts, where they performed works by Dvorak, Beethoven, Ravel and John Williams for an audience of patients, peers and community members. 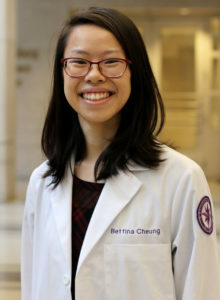 Bettina Cheung, a second-year student in the Medical Scientist Training Program. Why did you choose Feinberg? When I was first interviewing at Feinberg, two things struck me: how genuinely happy students seemed to be here, and how collaborative the environment was. The culture of teamwork in our medical education as well as in all the research labs really drew me to Northwestern. The idea that everyone has something to share and should be given a chance to do so is pervasive in our curriculum. We’re taught by peers in our clinical experiences at ECMH and in the classroom in problem-based learning. In the lab, I’ve seen multiple instances of fellow students collaborating together on projects and teaching each other different techniques. On a different note, as a student in the MD/PhD program, I also knew I wanted to spend my 20s in a big city with a lot to explore, and Chicago is exactly that! I love finding new things to do, and every time I talk to classmates, I hear about more activities to try. I’ll be joining the laboratory of Alan Hauser, MD/PhD, in the Department of Microbiology-Immunology for my PhD. Our research focuses on antibiotic-resistant bacterial infections in an effort to understand pathogens which cause hospital-acquired infections. The hope is to use what we find to develop new therapeutics to combat these bugs which are already resistant to some of our strongest antibiotics. As a medical scientist, I aim to work on research problems which have implications for patient care. Microbiology is not only a fascinating topic to me personally, but it’s growing in importance as antibiotic resistance continues to rise. I hope that what we learn in the lab can be moved to the clinic and improve treatment for patients. What inspired you to co-found the Northwestern Medical Orchestra? Music has been a passion for me my whole life, and playing the French horn has always been an important activity for me to make time for. It’s easy to become wrapped up in our responsibilities as students or other members of the health profession, and taking the time to express my identity as a musician helps me to find balance. When my good friend and fellow undergrad orchestral board member, Michael Wang, matriculated at Feinberg with me, we were in a great position to form an orchestra. We knew there must be other musicians out there in the Northwestern medical community and were excited to be proven right when other students, physicians, alumni and staff members joined us for our first season. It’s been a blast getting to know people in so many different stages of training every week in rehearsal, and at least one alum has told me the orchestra has been her “cure for burnout.” We’ve also received so much support from AWOME and our peers — a few hundred came to listen to our concerts! I’m so glad the orchestra has been able to provide a positive experience for our community. Additionally, as musicians in medicine, we’re in an exciting position to reach patients. We’re very grateful to the Shirley Ryan AbilityLab for providing us with an incredible rehearsal space each week, and being in this space allows us to perform for patients who come to our rehearsals and concerts. We also rounded off our first season last spring by performing at the All of Us Kickoff in Millennium Park to support the NIH’s precision medicine initiative. Looking ahead, the orchestra has begun a chamber music initiative, and we’re hoping to perform in more settings and bring music to more patients who might request it in the future. With all of this under our belts already, I’m very much looking forward to seeing how else the orchestra will continue to grow and reach larger audiences in the next seven or so years that I’ll be at Feinberg. What are your other interests outside of medical school and the orchestra? To maintain balance between school and managing the orchestra, I try to take advantage of all Chicago has to offer in my spare time! I love attending Chicago Symphony Orchestra concerts regularly, especially since we have access to special student pricing for these world-class performances. I also enjoy exploring the museums in the area (many of which have free Illinois resident days). The Botanical Gardens are a bit of a hike but they’re definitely one of my favorites. I also love baking and taking my dog to the parks in the area. I really appreciate all the student budget-friendly activities we have here in Chicago. What has been your most rewarding experience at Feinberg so far? The orchestra will perform concerts December 11 at 6:30 p.m. at the Shirley Ryan AbilityLab and December 14 at 7 p.m. in Thorne Auditorium. For more information, visit the Northwestern Medical Orchestra website.